May 18, 2000. FORT ERIE, ONTARIO: The leader of a major Catholic organization devoted to promoting the Message of Fatima has praised the Pope’s decision to release the final part of that message, known as the “Third Secret.” At the same time, Father Nicholas Gruner requested that the Vatican release an authentic photocopy of the original document written in 1944 by Sister Lucia dos Santos, the only surviving witness to the apparitions of the Blessed Virgin at Fatima, Portugal in 1917. Fr. 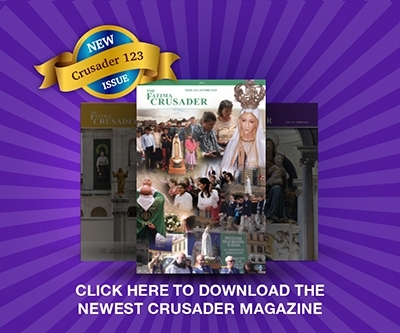 Gruner’s Fort Erie-based Fatima Center has promoted the International Fatima Rosary Crusade since 1978 and also publishes a quarterly magazine, The Fatima Crusader, with more than a million U.S. and Canadian readers. He was in attendance at Fatima recently, when Cardinal Sodano announced in the presence of the Pope that the Vatican would finally publish the Third Secret together with an official commentary. The document was originally intended to be published in 1960, but has been withheld by successive Popes since that time. The content of the Third Secret has been the subject of controversy and extensive speculations for the past 40 years. Fr. Gruner’s organization has repeatedly called for the publication of the text, notably at four international conferences attended by Catholic bishops, priests, and laypersons around the world. The most recent call came from a conference held in Hamilton, Ontario last October. The Vatican has not set a date for the publication of the text and its accompanying commentary. However, the Rome-based Zenit news agency reported on May 14 that the commentary would be published “in a few days”.